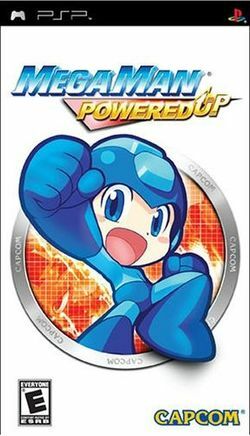 Mega Man: Powered Up is an updated release of Capcom's first classic Mega Man game. Known as Rockman Rockman in Japan, it features Mega Man drawn with a chibi (big head, small body) anime style and introduces two new robot masters for Mega Man to fight against. This release is exclusive to the Sony PlayStation Portable. In December 2008, Dr. Albert W. Wily had finally had enough of living in the shadow of his colleague, Thomas Light. Light's reception of the Nobel Prize the previous year, as well as his winning the LIT Manual Design Contest drove him over the edge. Wily realized the potential of what he and Dr. Light had been designing with the Light Labs team. Robots with true A.I. built for industrial purposes could be used for other means. It was to this line of thinking that Wily turned one night that month when he snuck down into the lab and reprogrammed all of the robots that he could get his hands on. However, he failed to get past the programming on Rock and his "sister," Roll. Still, Wily figured that in the end he wouldn't have much use for a lab assistant and a housekeeper, so he took his new army of industrial powerhouses and fled the lab. When Light came in, he found his lab in shambles and soon discovered that his colleague was to blame. With Wily on the loose with an army of intelligent and powerful robots, Dr. Light knew that the world's police forces and armies weren't ready to deal with this new challenge. It was thus that Rock, the lab assistant, volunteered to be converted into a fighting robot. Rock had a strong sense of justice and couldn't sit by and watch his "father's" work be destroyed before his very eyes. As such, Light reluctantly converted the former lab assistant into a robot of unimaginable potential. Equipped with titanium armor and a plasma cannon, Rock became known as the fighting robot Mega Man and set out for Wily's new fortress of Monsteropolis. Would he be able to stop the evil madman from taking over the world? This page was last edited on 13 March 2012, at 03:11.